No matter what your preferences are in an SUV, you will be able to find exactly what you are looking for in the 2017 Ford Explorer. There are five different models for you to choose from, each of which will appeal to a different type of driver. This is the ideal Explorer trim level if you love the Explorer but don’t need an expansive array of features. Even this trim level gives you the SYNC infotainment system along with a 4.2-inch display, Bluetooth, inputs for auxiliary audio, USB, and a CD player. You still get a rearview camera, roof rails, LED headlights and taillights, 8-way power for the driver, a tilt-and-telescoping steering wheel, and versatility from the 60/40 second row and 50/50 third row. If you want extra interior comfort with 10-way power for the driver and 6-way power for the front passenger and conveniences like satellite radio and push-button ignition, the Explorer XLT makes sense. This trim also has its own exterior styling elements and more LED lighting. The XLT trim will be ideal if you want the base 3.5-liter V6 engine with extra features since only the Base and XLT trims come with this engine. While the base trim only has the features mentioned above, the XLT has an incredible array of options and packages so you can premium features with this base engine. Those who don’t want to have to upgrade separately to get the 2.3-liter EcoBoost engine or SYNC3 will appreciate the 2017 Explorer Limited. This is also the trim level for those who want to take advantage of the incredibly convenient class-exclusive power-folding third-row seat. This particular trim will also give you even more features, like heating and power adjustment for the steering wheel, driver-seat memory, 8-way power for the passenger, a 180-degree front camera, navigation, 12 speakers, and a hands-free power liftgate. This is also the lowest trim level with some of the advanced safety features, such as lane departure warning and intervention, automatic parking, rear cross-traffic alerts, and blind spot monitoring. Therefore, if you want these features for the lowest price, go with the Limited. 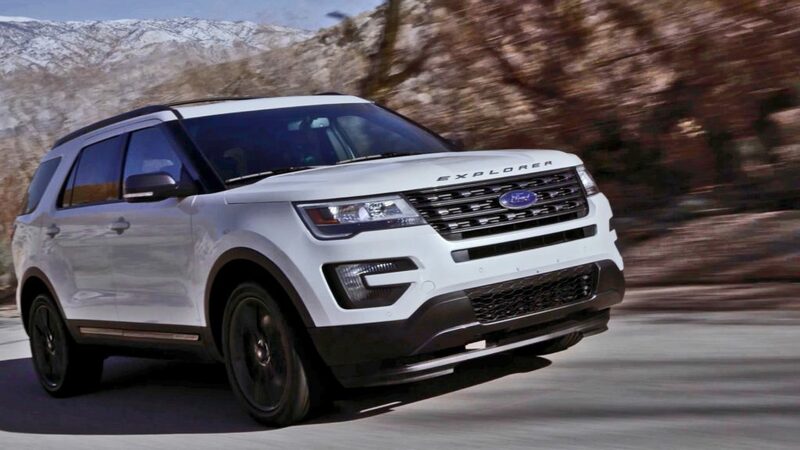 As the name implies, the 2017 Explorer Sport will appeal to those who prefer sporty styling on their vehicle. It comes standard with Intelligent 4WD and the more powerful 3.5-liter EcoBoost engine. It also throws in a sport-tuned suspension and unique styling. The Platinum will be ideal for Hoover, Alabama, drivers who want the best possible Explorer with all the available premium amenities. This trim comes with nearly every single option on the other trims. In fact, it is so well equipped that the only options available are second-row captain’s chairs featuring power-assist fold and a rear entertainment system. In addition to features already mentioned, you get upgraded leather upholstery, a dual-panel sunroof, and adaptive cruise control. No matter your personal preferences, the team at Long Lewis Ford can help you find the perfect 2017 Ford Explorer trim for your drives around Hoover, Alabama.